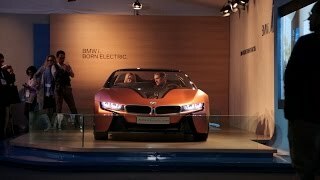 To make the high-end luxury car experience better, BMW shared its BMW i Vision Future Interaction Concept 2016 BMW i Vision Future Interaction Concept 2016. 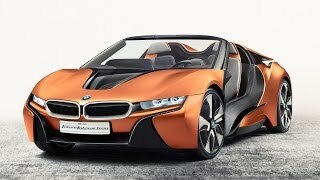 The first sight of the model might recall you the long back shared i8 Spyder Concept. Featuring a ‘networked cockpit’ and autonomous driving mode, the model is adorned with gorgeous looks. Let us have a look at the detailed review of BMW i Vision Future Interaction Concept 2016 to know in detail about it. Looking at the interior of BMW i Vision Future Interaction Concept 2016 you’ll understand that the company has put their primary focus at the interior. Starting with the dashboard which is slick and is designed in geometric pattern, you’ll further notice the 21” panorama display. The latter is designed in a way that it becomes user friendly for both passenger and the driver. The screen spreads to up to 16 inches is designed in a way that it doesn’t obstructs the front vision. There is also a heads up display to compliment the entire experience. Talking further about the technology, the concept comes with next generation gesture control system and Air Touch. The steering wheel also has a single button on its left side which helps you navigate quicker. There will be three driving models; Pure Drive, Assist and Auto Mode. Each of them will bring to you a newer interior experience. 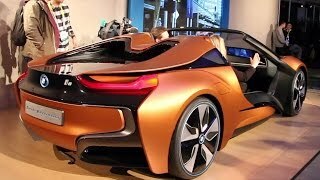 Thus rounding up the interior details of BMW i Vision Future Interaction Concept 2016 I would say, it is gem of a work. The exterior of BMW i Vision Future Interaction Concept 2016 has one thing that isn’t common and that’s the door free exterior. The entire open concept comes with the sleek kidney grille, aggressive headlights while the lower portion comes with sleek air duct to deliver fresh air to its engine. The exterior doesn’t has enough of changes but yes the accents on hood and across the lights make it look gorgeous while the door-free touch makes it gain another look. The side view mirrors get replaced by cameras giving the concept a sleeker appearance. While the headlights come with laser function the tail lights come with LED. In all the exterior of BMW i Vision Future Interaction Concept 2016 is aggressive, sporty. Engine beneath the hood of BMW i Vision Future Interaction Concept 2016 is still not shared, however carrying resemblance with the i8 hybrid model with its body and features. We expect to have the same 1.5 liter three-cylinder generating 231 hp and an electric motor with 131 hp. However not being confirmed we can’t assure and thus will recommend you to wait till the time company unveils the performance figures of BMW i Vision Future Interaction Concept 2016.